I am not a fan of movies that tell the story of tragic real life events too early. Especially, from recent terrorist attacks. There are so many movies about 9/11 I have actually lost count but this movie about the Boston Marathon attacks is….different. Most of the 9/11 films make me angry as they seem to benefit from all the lives lost in those tragic events. This film shows a United front from the city and gives so many reasons why its one of my favourite cities in America! The film is based around the tragic events of the Boston Marathon bombings in 2013. The story is centralised around the two bombers and the amazing Boston police force on how the came to capture and arrest the individuals. I’ve visited Boston nearly 10 years ago now and it is one of my favourite cities in the States. The people of Boston are amazing and this film shows how the whole city unites to stop the terrorists and the compassion they show on the day of the events. The film follows the attackers just before the attacks till the very end where they are apprehended. It shows the methods and techniques used form the police in order to find them which in itself is very interesting. The film uses the actual footage from phones, CCTV and news footage which makes you feel like you are back to the actual event rather than watching a movie about it. This makes it more real and horrific to watch. Mark Wahlberg takes the lead in this movie and has two different sides to his character before and after the events. Mostly, he shows the strength it took to hold himself together after the explosions and lead the Boston police force to help the citizens who were injured. He was a great leader figure and also showed how he was basically just an average police officer but in a very serious situation. He also shows a very real emotions to the death and devastation which was very hearth felt. Wahlberg is originally from Boston so this film is a true testament to his city and a great performance he can be proud of. I usually steer clear of films like 9/11 etc but this film was something that I felt would be different. It is a great movie but based on horrifying events. It is a film that honours the Boston Police Department and a film that shows the unity of the city itself. I love Boston and this film shows the heart of the city in terrible circumstances. I rate Patriot’s Day 8/10! 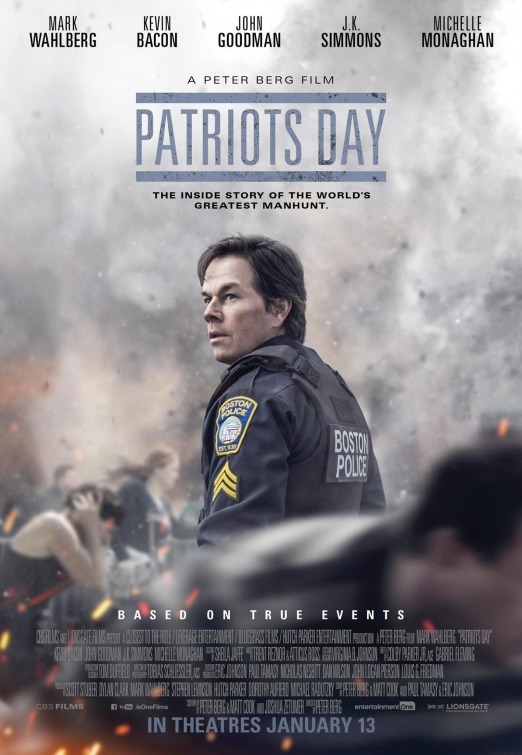 Patriot’s Day is in cinemas NOW!